Baroque, Willem van de Velde d.Y. Oil on panel, 36,5 x 41 cm. Willem van de Velde the Younger started by painting frigates in windless weather, where the graduating reflection of light in the water was the subject of study. 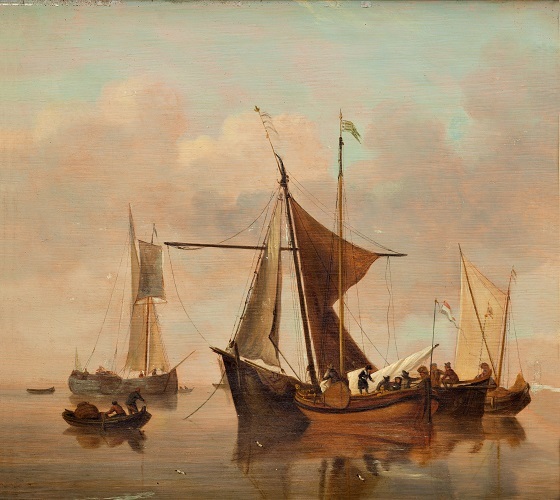 His interest in the interplay of light and the surface of the water is evident in this marine painting where a boat with passengers is heading towards a sailing ship. The ship is anchored beside a small vessel under sail, while two fishermen go about their business in a boat with a large fish trap. Both the ships and the golden light are vividly reflected in the glassy surface of the water, while the misty horizon blends into one with the sky above. Van de Velde was one of the most eminent marine painters of the Dutch Golden Age and studied under both his father, Willem van de Velde the Elder, and later Simon de Vlieger, whose grey-toned marine paintings were an early source of inspiration to the artist.